Welcome to the Michigan State University Kellogg Biological Station shoreline management web site. This site offers information about alternatives to “turf to the water’s edge” landscaping and takes a look at our alternative shoreline management demonstration efforts at MSU’s Kellogg Biological Station(KBS). The Michigan Natural Shoreline Partnership is another source of information, publications and educational programs for both lakefront property owners and waterfront contractors. Learn more at www.mishorelinepartnership.org. 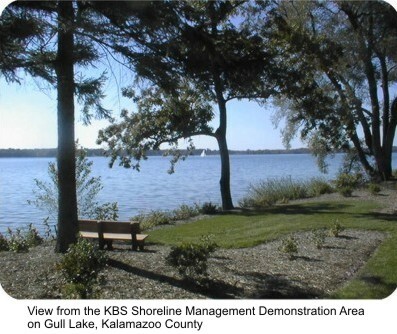 The loss of shoreline vegetation is an increasing problem around Michigan lakes. The recreational value of our lakes has led to intense shoreline development and the proliferation of turf lawns down to the water’s edge. This conversion of natural shoreline vegetation to high maintenance, shallow-rooted turf, in conjunction with increased boat traffic and wave action, contributes to shoreline erosion problems, the delivery of fertilizers and pesticides to lake water and the loss of habitat.